You might already know that tires are one of the most important parts of your vehicle. They're the only part of your car that makes contact with the road, but if you hit a deep puddle of water when you're going fast, you can hydroplane. Your tires aren't touching the road then, and you could find yourself in an accident. But there are ways that you can minimize the chance of hydroplaning. 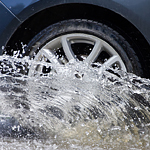 One of the most important things to do is to have a set of quality tires that are made to push water away from them so that you don't hydroplane. Another important thing to do is to slow down before you hit the puddle. If you begin braking when you're in the puddle, this will only increase your risk of an accident. If you need a new set of tires on your vehicle, come to Mark Mitsubishi in Albuquerque, and we'll find the right set for you.